Parenting a toddler has its own set of milestones and challenges, one of which is getting your toddler to eat foods that are healthy and full of nutrition. 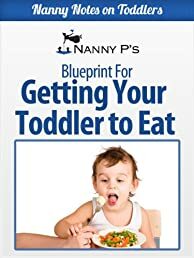 In this Nanny P Blueprint you'll discover a set of strategies that you can use to get your toddler eating new foods in a way that is fun and enjoyable. Nanny P blueprints are written with the busy parent in mind. Each blueprint is designed to tackle a specific issue in a short and concise way so that you do not need to spend time reading through a lot of other material to find tips and methods for the specific topic you are looking to address. If you're looking for ways to get your toddler trying new foods that will be fun for him or her, then "Nanny P's Blueprint for Getting Your Toddler to Eat" is for you!